Sell adhesive tape on Export Portal, find international customers and potential markets all over the world. Buy adhesive tape on Export Portal, get the best for your business due to fast and qualitative shipping. 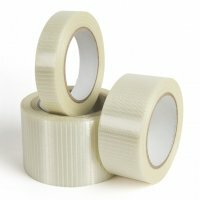 There are four types of adhesive tape which are used in all areas of human activity. Pressure-sensitive tape - consists of a pressure-sensitive adhesive coated onto a backing material such as paper, plastic film, cloth, or metal foil. It is sticky (tacky) without any heat or solvent for activation and adheres with light pressure. These tapes usually require a release agent on their backing or a release liner to cover the adhesive. Water activated tape - is starch- or sometimes animal glue-based adhesive on a kraft paper backing which becomes sticky when moistened. A specific type of gummed tape is called reinforced gummed tape (RGT). The backing of this reinforced tape consists of two layers of paper with a cross-pattern of fiberglass filaments laminated between. The laminating adhesive had previously been asphalt but now is more commonly a hot-melt atactic polypropylene. Heat sensitive tape - is usually tack-free until it is activated by a heat source. It is sometimes used in packaging, for example, a tear strip tape for cigarette packs. Drywall tape - is usually made of paper, cloth, or mesh, sometimes with a gummed or pressure-sensitive adhesive. It is used to make the joints between sheets of drywall materials. Sell and buy packaging products on our hugest internet platform. Develop your business on Export Portal! Gain incredible momentum in the marketplace among the international customers. Register now and make your export opportunities grow worldwide.